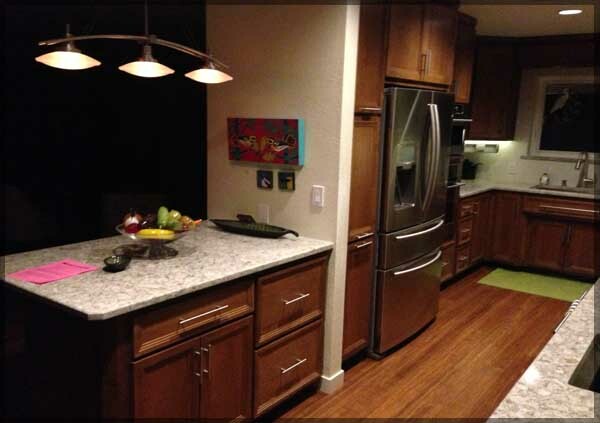 During 2013 Carey Designs was given the challenge of creating a kitchen that would be used by a professional baker and would replace cabinets which were originally handmade by her husband. As you can imagine, creating something for the person who created the original space can be a challenging task. This kitchen not only needed to be beautiful but also as functional as possible aid in the creation of the many delectable goodies that are made in it. The kitchen is filled with many custom cabinetry features, lighting schemes, and high-end appliances to achieve these goals. 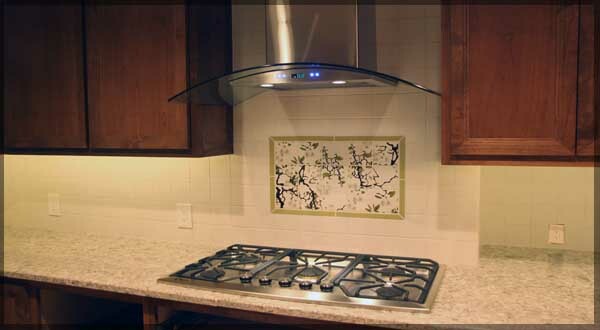 A state of the art kitchen remodel was just the beginning of this project. 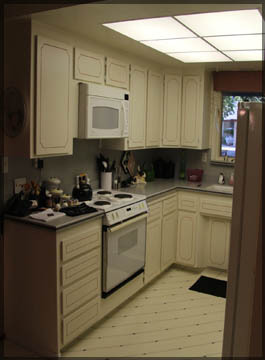 To gain the space needed for the kitchen project, 300 square foot was added to the front of the house to make the kitchen larger. In this process the living room and garage were also extended. Structural engineering, redesigned lighting, and new hardwood floors were added throughout the new space. 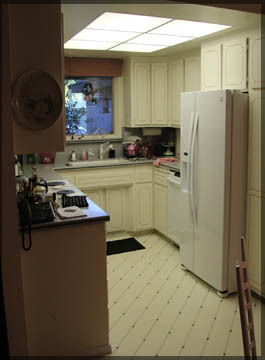 These before pictures show the original kitchen before the addition. One of the pre-requisites for the new design was that every effort be made to not make the new space feel boxy and enclosed. Additional items on the "wish list" included: More counter space, lighted work areas, easy to clean, interior cabinet organization solutions and a more open feel. The finished project incorporated all of the wish list items (and then some). Once the space was extended there was room to incorporate a full island work area for cake decorating, double ovens (one of which is a microwave and convection combo), a full sink, prep sink, french door refrigerator, high CFM hood, and high BTU range. All cabinets in the kitchen are made of Alder with Maple interiors. Doors were designed that mimicked existing architectural details throughout the house and thereby join the old to the new seamlessly. The island was designed with a slight overhang for the counter on the kitchen side and a twelve inch overhang on the living room side to accommodate barstools for additional seating. Toe kicks throughout are covered with black melamine to draw a definitive visual line between the cabinets and new flooring. 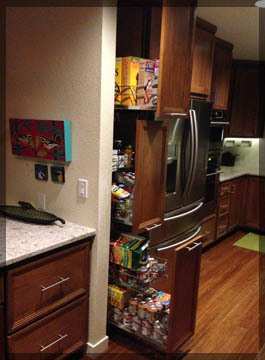 A new pantry was created using pullout storage solutions. 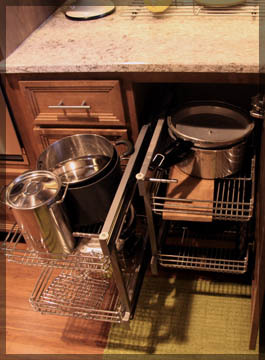 All space in the corners was made easily accessible through the use of blind corner stainless steel pullouts. 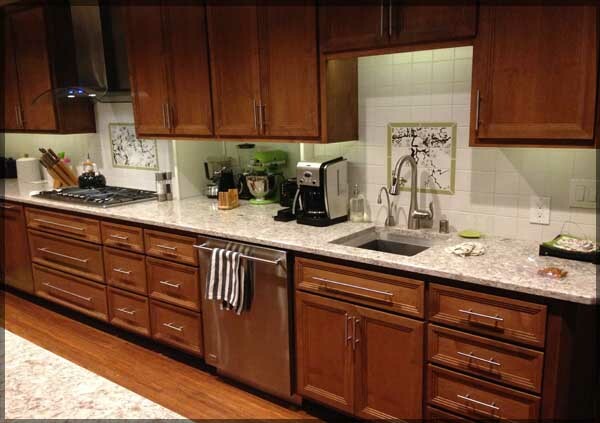 All counter surfaces are granite with square edges. Hardware (both interior and exterior) are stainless steel and brush nickel to coordinate with all of the Stainless steel appliances. The owners of this kitchen are avid bird-watchers which was the inspiration for the cherry blossom tile splashes behind the range and prep sink. Both sinks are brushed Stainless Steel made by Kohler with accessories such as cutting boards, suspended wine glass drying racks, and normal dish drying racks. Green colors and glass were incorporated to bring the light open qualities found in nature into the kitchen.